Produce materials for presentations and events quickly and effectively on an all-in-one HP Pro 500 laser printer. The multifunction device also provides you with opportunities for storing, reproducing and sending important documents. HP LaserJet Pro 500 laser printer prints up to 31 pages per minute (ppm) in black and in color. 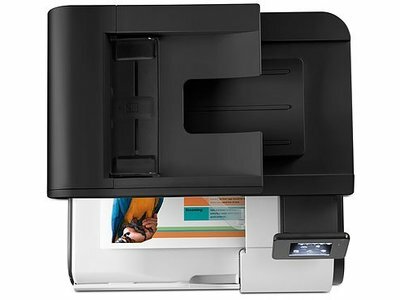 HP Pro 500 laser all-in-one printer copies up to 31 cpm in black and in color. Flatbed scanner with 8.5" x 14" scan area. Scan resolution up to 1200 x 1200 dpi to reproduce exact details. High-speed fax with up to 250-page fax memory to meet your office needs. HP LaserJet Pro 500 printer is compatible with a variety of media. Prints on envelopes, transparencies, labels and cards. 250-sheet paper tray can handle complex print jobs. Also includes a 100-sheet multipurpose tray for envelopes, letterhead and more. Built-in 3.5" touch screen lets you view projects before printing them. Access, store, and print web content from the touchscreen, using business apps.5 Customize color settings for vivid results, and create marketing materials in the office. Print right away thanks to pre-installed cartridges. Install your printer in just a few minutes. Print from your smartphone or tablet from virtually anywhere, using HP ePrint.3 Access, share, and print with convenient networking. Proactively monitor your printer to help improve management. jfha73: For the price, this MFP is more than expected, excelent product. newhp2017: We have had this HP LaserJet 500 color printer for almost a month and we have been very imressed with the function and print quality of this printer! mike1975: Upgraded from an older HP printer. Print speed is fast for my size office and easy to use. 1 Simplex speed measured using ISO/IEC 24734, excludes first set of test documents. For more information see hp.com/go/printerclaims. Exact speed varies depending on the system configuration, software application, driver, and document complexity. Duplex speed measured internally and may be less than 29 ipm depending on how print job is configured. See h41302.www4.hp.com/km/saw/view.do?docId=emr_na-c03735617&hsid=49244267&sz=5785 for details. 2 HP LaserJet 507X Black Toner Cartridge not included; please purchase separately. 3 Requires an Internet connection to HP web-enabled printer and HP ePrint account registration (for a list of eligible printers, supported documents and image types and other HP ePrint details, see hp.com/go/eprintcenter). Mobile devices require Internet connection and email capability. May require wireless access point. Separately purchased data plans or usage fees may apply. Print times and connection speeds may vary. Some HP LaserJet printers may require firmware upgrades. 4 Program availability varies. Original HP cartridge return and recycling is currently available in more than 50 countries, territories and regions in Asia, Europe, and North and South America through the HP Planet Partners program. For more information, visit: hp.com/recycle. 5 Requires an Internet connection to the printer. Services may require registration. App availability varies by country, language, and agreements. For details, see hp.com/go/eprintcenter. 6 HP Auto-On and Auto-Off Technology are subject to printer and settings. Instant-on Technology claim based on comparison with products that use traditional fusing. Instant-on Copy claim based on comparison with fluorescent tubes. 7 Requires an operating system with power management capabilities, such as Windows 8 or Chrome. 8 Use of HP ePrint Home & Biz app requires Internet- and email-capable smartphone or tablet with separately purchased wireless Internet service, an Internet connection to the printer, and HP Web Services Account Registration. Wireless performance is dependent upon physical environment and distance from access point. Both the printer and mobile device must be on the same wireless network. Wireless operations compatible with 2.4 GHz routers only. See hp.com/go/mobile-printing-solutions for details on compatible devices and supported documents and file types. 9 Duty cycle is defined as the maximum number of pages per month of imaged output. This value provides a comparison of product robustness in relation to other HP LaserJet or HP Color LaserJet devices, and enables appropriate deployment of printers and MFPs to satisfy the demands of connected individuals or groups.